I'm so thrilled to have Jason Pellegrini here as a guest to review the ever popular, Needful Things! A King novel that has always been in my top 5 favorites, it's so much fun to read a review from a first time reader. Better late than never. 😉 Read about his journey through Castle Rock. There was a new shop in town, run by a stranger. Needful Things caused some gossip and speculation amongst the good folks of Castle Rock, Maine, while they waited for opening day. The store contained something for everyone. Something they really just had to have. And always at a price that they could just afford. The cash price, that is. Because there was another price to pay. There always is when your heart's most secret, true desire is for sale. It has been a yearly tradition of mine to kick off the new year with a Stephen King novel. For the past decade, I have started my year off with the Master of Horror. Well, except for that one year, where I decided to give my tradition a break and give Richard Bachman a go. ::wink, wink:: As the years have gone by, though, and I found myself soaking up King as much as I could throughout the entirety of the year, I began to feel that maybe I burned through all his essentials (The Shining, IT, The Green Mile and Salem’s Lot, just to name a very few) too quickly, and now all that remained were ones that would undoubtedly still be enjoyable, but would not be those captivating epic tales I had grown accustomed to, like The Stand or 11/22/63. As 2017 came to a close, I began to debate which King book to start 2018 off with. As I stared at my bookshelf, none really jumped out at me as one that I just had to read. I began to accept that I would just pick one and that would be my choice. Then I came up with the idea of letting other people decide which King book would be my first read of the new year. I turned to Twitter and put up a poll for my follower to vote on. I chose for books at random—Rose Madder, Sleeping Beauties, Needful Things and The Colorado Kid—and my fate in the hands of fellow readers. After the initial posting, I stepped away from Twitter and when I returned a half hour later, curious to see what had taken the lead, one book had stood out above the rest. That book was Needful Things. On top of the early commanding lead, I received multiple comments on the tweet from people, asking me how had I not read it yet, or stating that it was one of their favorite—if not their outright favorite—novels by King. My interest was immediately piqued, and Needful Things was instantly on my radar. Was it possible that I hadn’t yet read every epic piece of literature that Stephen King had to offer? It was seemingly possible, and throughout the duration of the poll being open to vote it seemed as if I was going to soon find out. By the time the poll closed on Twitter, Needful Things had a strong lead over the other titles with forty-three percent of the votes. Nearly five-hundred people had spoke up, and had chosen it as my next King read. I entered 2018 with a sense of eagerness I hadn’t felt for a long while with a book. Especially, admittedly, a Stephen King book. I woke up on New Year’s Day, got comfortable on my couch and cracked the spine of the first edition hardcover I had picked up for a steal at a local thrift store. It did not take long for me to realize that I had been missing out on something unique. It had all the traits of a King novel that I loved. The ones that kept me coming back for more, and made a daunting over five-hundred page novel seemingly fly by. This one was undoubtedly going to be considered Stephen King’s hidden gem. 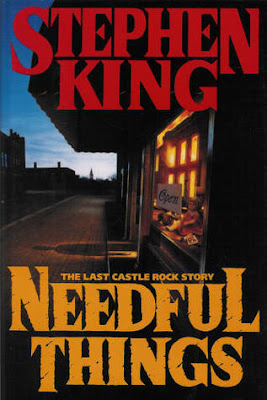 Needful Things is a story of the fictional town of Castle Rock. Like some of his other works with towns spawned from the author’s imagination, such as Derry in IT or Jerusalem’s Lot in Salem’s Lot, King puts the time in to breathing life into the town and making it seem as real as the town we, the reader, live in. For those familiar with his work, it is no secret that King is a fan of the small town ambiance. The place where everyone knows everyone and secrets are hard to keep. Castle Rock is no different. It is place where little happens, and when something does happen, the whole town takes notice and has all the residents abuzz. This is shown when a new store pops up on Main Street (cause all small towns need a Main Street, right?!). The name of this new establishment in Needful Things. With only an ‘Opening Soon’ sign in the window that reads ‘A new kind of store’ written on it, Needful Things gives the residents of Castle Rock very little to go off of. This gets the chatter going, and creates a buzz for the establishment, even before it opens. Despite growing speculation, the people of Castle Rock would find, once Needful Things opened its doors for business, that what the small business had to offer far exceeded anything they could have possibly imagined. With the guidance of the store’s almost too charming proprietor, Leland Gaunt, what each and every customer that stepped inside Needful Things would find was the one thing in life they wanted most. Whether what a person was looking for was a super rare 1950’s signed baseball card, a photo of Elvis Presley, a fishing rod, a foxtail, or even an ancient charm that promised to heal the most painful of arthritis, Needful Things somehow had it. And at an affordable price, too! There was just one catch (isn’t there always?)! Leland Gaunt would let his merchandise go for an almost unfathomable discounted price if the purchaser promised to play a small prank on another random resident of Castle Rock. One that was harmless, Gaunt would assure each and every person who passed through his store and found an item they just needed to have. Only the pranks would turn out to be not as harmless as promised, and as they played out, one after the other, the town of Castle Rock would find itself on the brink of utter destruction. Needful Things is the embodiment of selling your soul to the Devil. Of what happens when the most selfish part of our being takes total control, and the repercussions for not being able to let go of the thing we desire the most. Even when we realize it is wrong. Like so many of Stephen King’s stories, the draw power of this work is not in the plot, even though this plot is a brilliant one, but in the characters. As a writer, myself, I am a firm believer that the plot moves a story along, but the characters are what builds the story. King has proven this to be a correct statement, time and time again. The characters, from main to secondary, are the meat and potatoes of Needful Things. In a story about the greediness that lies within us all, King uses his abilities to flesh out characters that show the ugliness called selfishness that lives inside so many of us. He also shows us that some people are capable of putting their selfish needs behind them for the better good and for the sake of others. No matter what human trait Stephen King desires to get across to his reader, he has a well-established character in place to carry out his bidding. Needful Things was an all-around strong read that does not lack in any aspect of storytelling or writing. Not that I needed much reminding, but it made me remember why Stephen King is my all-time favorite author. It is a clinic in character development for aspiring writers. Even though it took me over a month to finish—I had to put it on pause to move—the novel did not drag. It is one of those doorstop novels, but never does it feel that way. A must for every constant reader. A 5-star read, through and through. 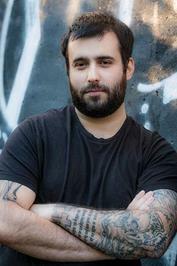 Jason Pellegrini is an award winning author from Levittown, New York. His works include Booth, The Cool Kids and The Replacement.